With refined styling and a streamlined profile, the imagine is packed with new design innovations. This banner stand is our most popular removable cassette roller system and has been specially designed for maximum convenience and ease of use. 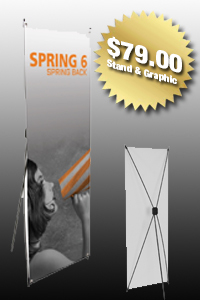 The Pegasus is a fully adjustable banner stands that are easy to set up and fit a variety of graphic sizes. From a small banner stand to a large backwall, either Pegasus will fit your needs. The Contender Mega banner stand has become a market leader proving its dependability time after time. A good all around work horse, the Contender Mega stand offers a strong construction combined with a sleek and ergonomic appearance. System comes with a carry bag and is available in black or silver.